SCIMITAR is a forum for international cooperation among researchers oriented to the study of the interface between grammar and discourse in present-day English. The methods used are strongly contrastive. We work on the intralinguistic comparison of different varieties of English, and cross-linguistic comparison of English with other languages, notably Spanish. The tools used are primarily those of corpus and computational linguistics, and the approaches taken include fucntional and/or cognitive models such as Functional (Discourse) Grammar, Systemic Functional Linguistics, Rhetorical Structure Theory, Construction Grammar, the Lexical Constructional Model, or Cognitive Grammar/Linguistics, among others. There are regular opportunities for research positions in SCIMITAR as Research Assistant, for graduate or undergraduate students; and for graduate students to do their theses. If you are considering this possibility, or if you are interested in any of the research areas covered by the team, please get in touch with us. 26-27/09/2018 Scimitar will organize the the 5th edition of International Workshop on Discourse Analysis (IWoDA18), in collaboration with the Discourse & Identity research group, the MUSTE research team, and the Lingua e Literatura Inglesas e Identidade III (ED431D 2017/17) research network. 12-14/09/2018. Gómez González, M.Á. will participate in Using Corpora in Contrastive and Translation Studies (5th edition) – UCCTS 2018 (member of Scientific Committee), The Centre for English Corpus Linguistics of the University of Louvain (Belgium). 29/08 – 01/09/2018. Gómez González, M.Á. and Gonzálvez García, Francisco will participate in 51st Annual Meeting of the Societas Linguistica Europaea, (members of Scientific Committee), University of Tallinn, Estonia. 16- 18/07/2018. Gómez González, M.Á. and Gonzálvez García, F. will deliver the paper ”Explaining English variable tag questions within an Applied Construction Grammar framework”. ICCG10 Tenth International Conference on Construction Grammar, organized by Sorbonne Paris Cité University (USPC) (Paris) and the French Cognitive Linguistics Association. 15-17/02/2018. Gómez González, M.Á. 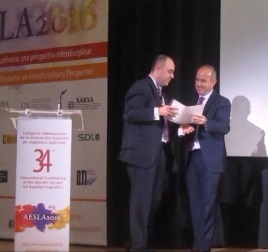 and Gonzálvez García, F. have submitted the proposal “Tag questions in an Applied Construction Grammar perspective”. Constructionist Approaches to Language Pedagogy 3. University of Austin at Texas (EEUU). Gómez González, M. Á. and J. L. Mackenzie (eds.). Forthcoming. The Construction of Discourse as Verbal Interaction. Amsterdam: John Benjamins. Gómez González, M. Á. Forthcoming. God that came out quick didn’t it eh”: Variable and invariable tag questions in British English. In M. Á. Gómez González and J. L. Mackenzie (eds.). 189-244. Doval-Suárez, S. M. and E. González-Álvarez. Forthcoming. The use of tag questions in the oral production of L2 English learners. In M. Á. Gómez González and J. L. Mackenzie (eds.). 245-283. Alba-Juez, L. and J.L. Mackenzie, 2016. Pragmatics: Cognition, Context and Culture. Madrid: McGraw Hill. Gómez González, M. Á. 2016. Canonical tag questions in English, Spanish and Portuguese: A discourse-functional study. In Marie-Aude Lefer & Svetlana Vogeleer (eds. ), Genre- and Register-related Discourse Features in Contrast. Amsterdam/Philadelphia: John Benjamins. Gómez González, M. Á. and M. T. Sánchez Roura. 2016. English Pronunciation for Speakers of Spanish. From Theory to Practice. Boston/Berlin/Beijing: Mouton de Gruyter. Gómez González, M. Á., M. T. Sánchez Roura, M. Torrado Cespón, A. Rollings and M. D. Gómez Penas. 2016. EPSS Multimedia Lab. (Interactive Website Patent). González Álvarez, E. and S. M. Doval Suárez. 2016. The use of extraposition in the written production of Spanish advanced learners of English. The Linguistics Journal. Hengeveld, K. and Mackenzie, J.L., 2016. Reflections on the lexicon in Functional Discourse Grammar. Linguistics 54.5. 1135-1161. Mackenzie, J.L., 2016. Dynamicity and dialogue: Perspectives from Functional Discourse Grammar. English Text Construction. 9.1. 56-76. Mackenzie, J.L., 2016. A first history of Functional Grammar. In Carlos Assunção, Gonçalo Fernandes & Rolf Kemmler (eds), History of Linguistics 2014: Selected Papers from the 13th International Conference on the History of the Language Sciences (ICHoLS XIII), Vila Real, Portugal, 25 – 29 August 2014. Amsterdam/Philadelphia: John Benjamins. Mackenzie, J.L. 2016. Functional linguistics. In K. Allan (ed. ), Routledge Handbook of Linguistics, London: Routledge. 470-484. Taboada, M. 2016. Sentiment analysis: An overview from linguistics. Annual Review of Linguistics. 2: 325-347. Trnavac, R. and M. Taboada. 2016. Cataphora, backgrounding and accessibility in discourse. Journal of Pragmatics. 93: 68-84. Gómez González, M.Á. and M.T. Sánchez Roura. 2016. 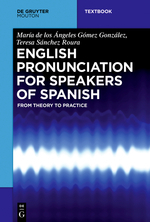 English Pronunciation for Speakers of Spanish. From Theory to Practice (EPSS). Boston/Berlin/Beijing: Mouton de Gruyter.